Europe's biggest car show features some of the nicest cars on the planet. 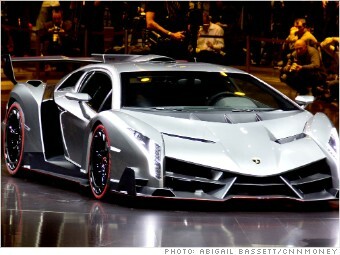 With an eye-popping $4 million price tag, Lamborghini says it will only build three Venenos - and they have all been sold. Much of the cost comes from its carbon fiber construction. The entire chassis and outer skin are made from carbon fiber reinforced plastics. The 750 horse power Veneno was unveiled Tuesday, but images were leaked to the press Monday.